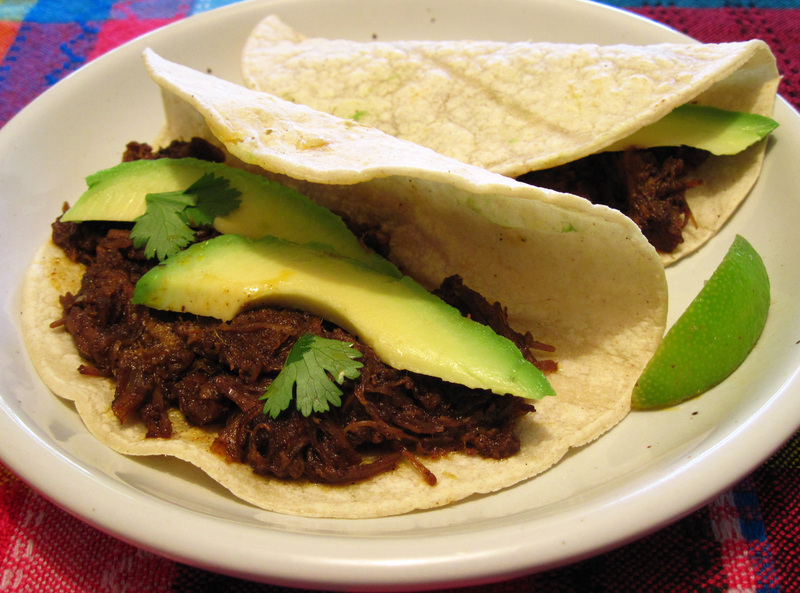 The Slow Cooker Mexican Pulled Pork on Simply Recipes has been on my “to-do” list ever since I first saw it. The mouth-watering photo that Elise posted and her description about how her friends swooned over it made me want to try it ASAP. With 6 people for dinner last night, I decided the group was big enough to give it a try. The recipe takes time, but it’s mostly unattended time, and it couldn’t be easier. 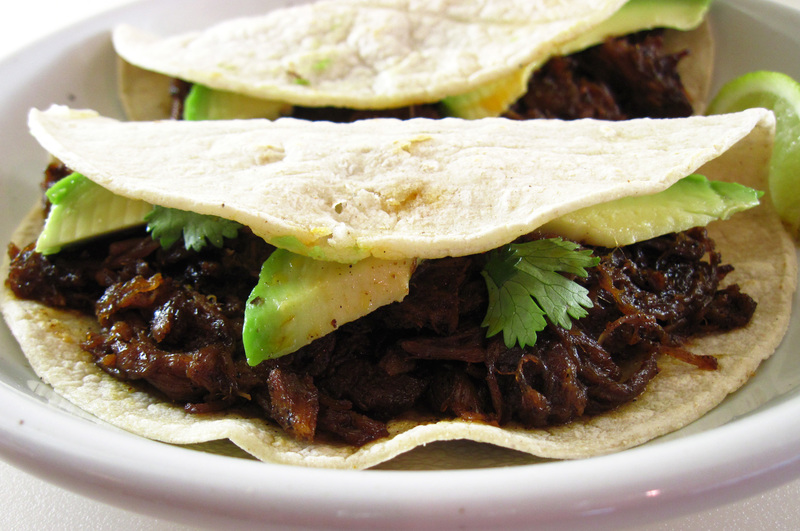 I think if you just try Slow Cooker Mexican Pulled Pork Tacos it will be one of your favorites, too! 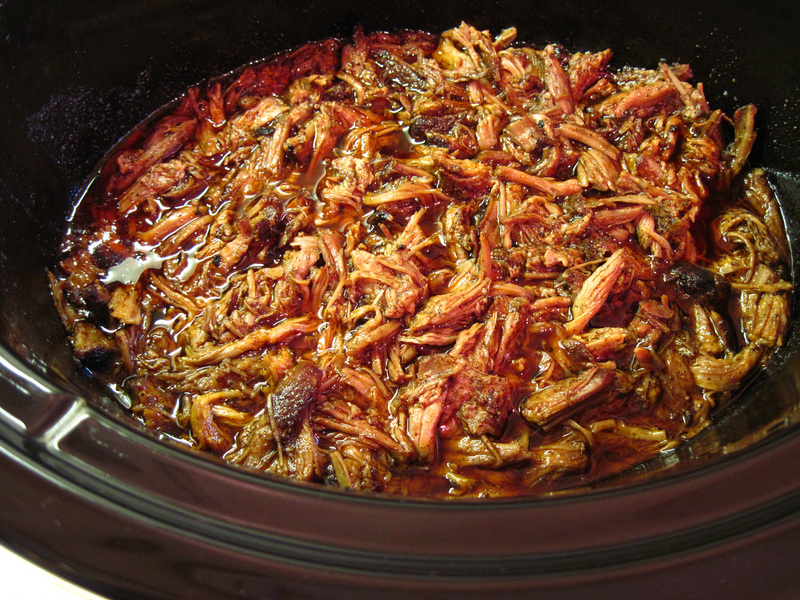 If you don’t have a slow cooker you could try a method similar to the one I used for Pulled Pork in the Oven. 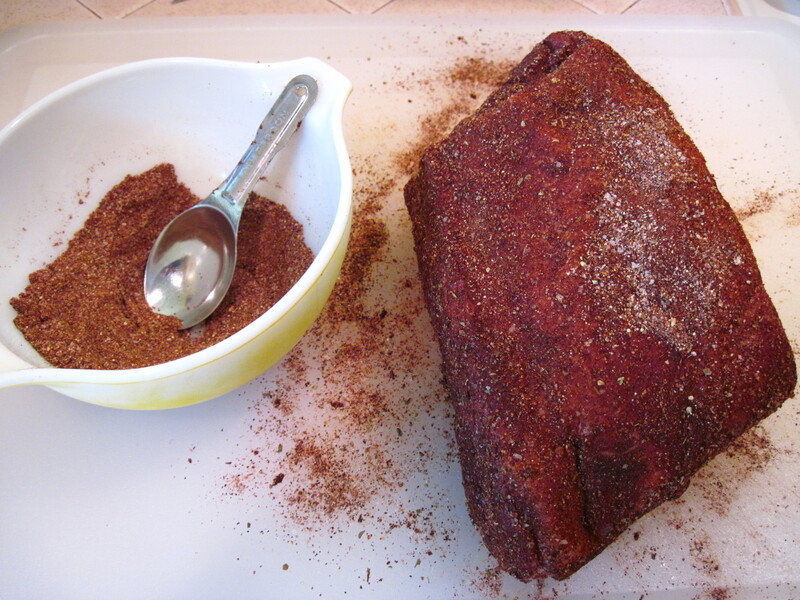 After the roast has been refrigerated with the spices, brown it in a large pot. (A Dutch oven would be ideal.) When it’s browned all over, add about 1/2 cup water to the pot, stirring up all of the tasty bits on the bottom. Sprinkle the reserved spice mix over the roast. 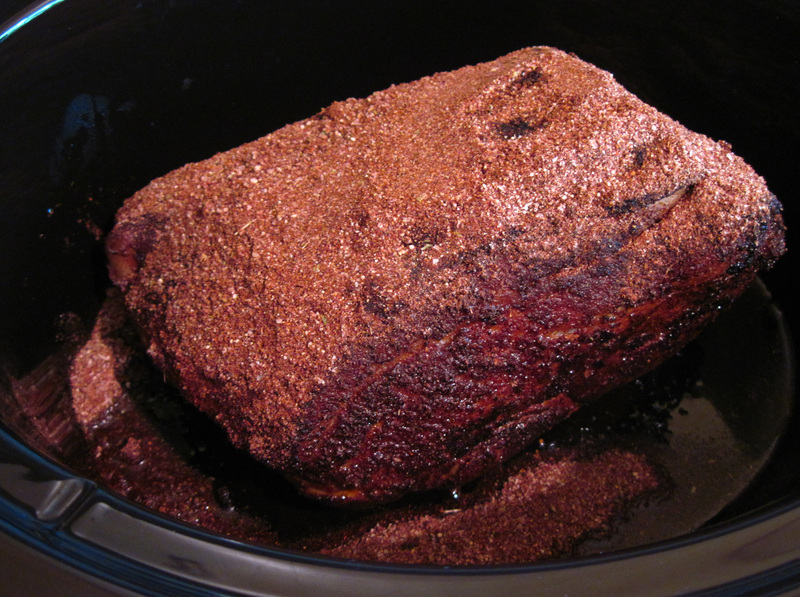 Cover it with a lid or as tightly as you can with aluminum foil and roast at 300˚ for 1½ hours. 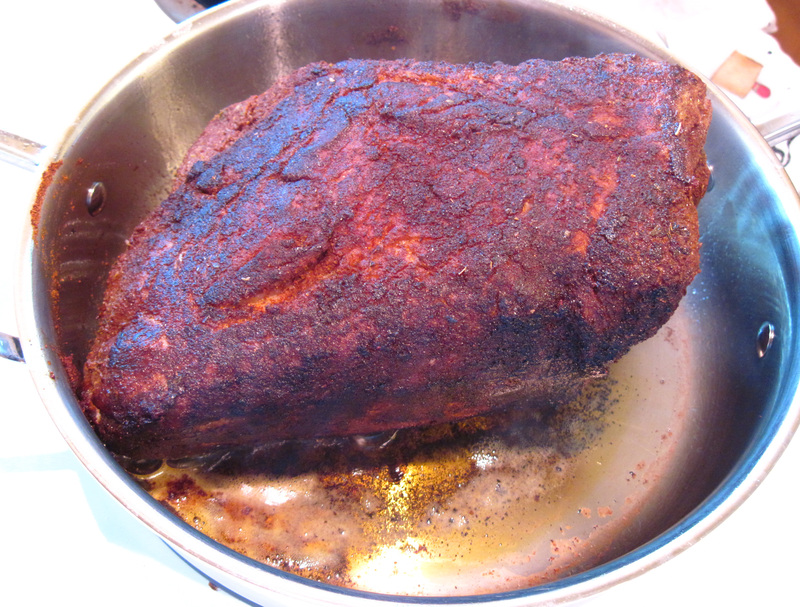 Turn the roast over, cover it again and continue to roast for another 2½ to 3 hours or until it is fork tender. Because this recipe doesn’t have any added sauce I would leave it covered the whole time so it doesn’t dry out. 1. The day before you want to serve the tacos, mix all of the spices together and rub them generously all over the pork roast. (If the roast has been tied, cut the string off first.) Reserve any leftover spice for the next day. 2. Cover the roast and refrigerate overnight. 3. Heat the oil in a pan and brown the pork roast on all sides. This will take 15 – 20 minutes. 4. Put the browned roast in the slow cooker and add in as much of the remaining oil and spices in the pan as you can. Extra spices are sprinkled all over the browned roast and it’s ready to go in the slow cooker. 6. Remove the pork from the slow cooker and put it on a cutting board. Using two forks, shred it into bite-sized pieces. 7. Stir the pork back into the spicy juices in the slow cooker. It can be kept on Warm until it’s time to serve. 8. Heat the tortillas using your favorite method. I like to heat them for about 30 seconds on each side in a hot cast iron skillet. I put them in foil as I go to keep them warm. 9. Assemble the tacos using your favorite toppings and enjoy the feast! This is adapted from an easy Bon Appétit recipe. 1. Whisk the vinegar, honey, and salt together in a large bowl until the honey and salt are dissolved. 2. Add the onion slices. Cover and leave at room temperature for 1 – 2 hours, stirring occasionally. 3. Drain for immediate use, or refrigerate for up to 2 weeks. Drain before using. 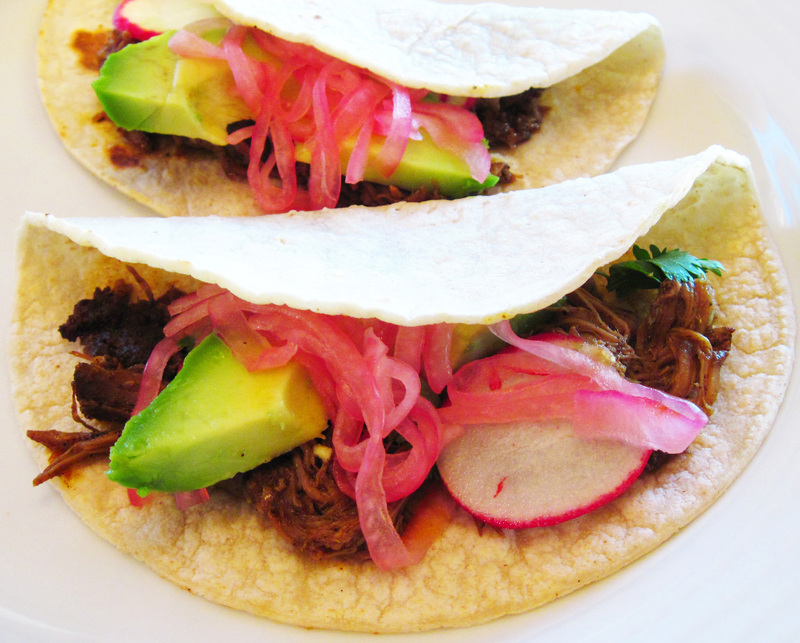 Mexican Pulled Pork Tacos with cilantro, avocado slices, Quick Pickled Onions, radish slices, and a bit of salsa. I was dreaming about these today — SO GOOD! I could eat this every day. I love all the spices on there. You know I’ve never put a roast in the crock-pot without liquid, I will have to try it. I really should use it more, it’s so easy. 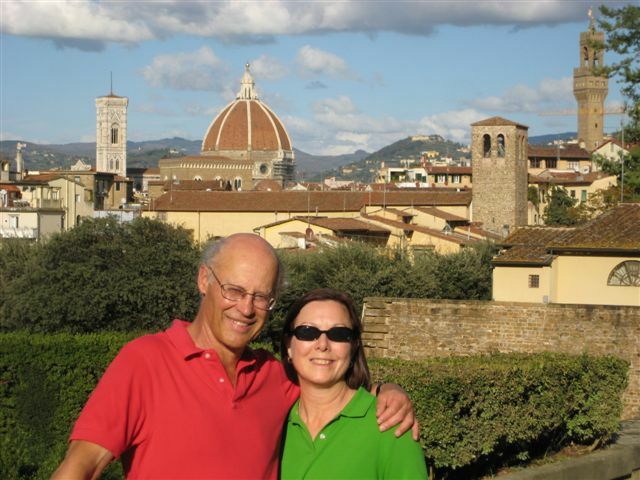 Hope you are having a great summer. The pickled onions bring it over the top. I’m moving you again, I swear this techy stuff will get the best of me yet. Give it a try, Gina. It’s so good! Be sure to use a pork shoulder roast; a pork loin or tenderloin would be too lean. I must say, this does look delicious. Complimenti! 4 TABLEspoons of chilli powder then 1 teaspoon of Cayenne pepper… wouldn’t this come out insanely hot? No, it was just right. I think the slow cooker tames the spices. Also, I used a “medium” chili powder, not one that was labeled “hot”. Wow – now that is one impressive piece of meat! That is Comfort food with a capital C! Thanks! It is truly one of my family’s favorite meals.